Artist David Bowman's "Expressions of Christ" series captures the love of our Savior in an up close and personal way. 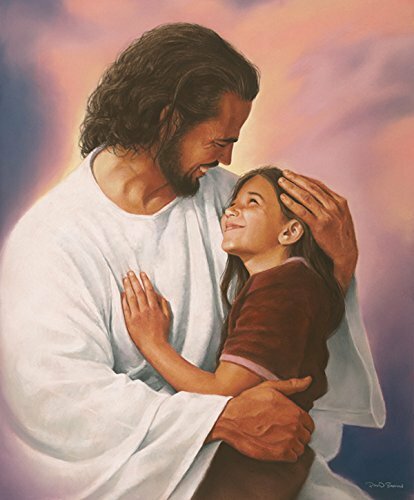 The expression between Jesus and the little girl (who happens to be one of the model's daughters in real life) says it all in this piece-"I adore you." The closer one draws towards the Savior, the more he or she adores everything about Him. Thus, I can only imagine the overflowing joy and love we will feel when we are actually in His presence, in His embrace. The feelings of adoration will be so intense and amazingly, I don't think they will be one-sided. I picture Christ peering so deeply into our hearts, with His perfect love, that His adoration for us will be just as intense. If you have any questions about this product by David Bowman, contact us by completing and submitting the form below. If you are looking for a specif part number, please include it with your message. wall26 The Virgin and Child with St. Anne by Leonardo da Vinci - Canvas Print Wall Art Famous Oil Painting Reproduction - 24" x 36"
Oopsy Daisy Fine Art for Kids Let's Set Sail Octopus Canvas Wall Art by Anne Bollman, 21 x 21"